Garmin’s Vivoactive 3 is one of the most advanced sport smartwatches on the market today. For all the tech and fitness lovers out there, this wearable is your dream come true. Garmin’s Vivoactive 3 has a lot of handy features up its sleeve. If you have an iPhone or Android, you can connect your phone to your Vivoactive and enjoy easy access to your phone from your wrist. From your watch, you can receive and respond to text messages, follow social media updates, and keep track of your emails. You can even see who’s calling you and either answer or decline the call. Take advantage of syncing with Garmin Connect, the online community where you can share your activities with others. You can also participate in challenges, share your activities on social media sites, and encourage others in their fitness activities. Garmin Connect is free and available online as well as through the Garmin Connect Mobile app for your smartphone. The Vivoactive 3 is a solid choice for a Garmin wearable. 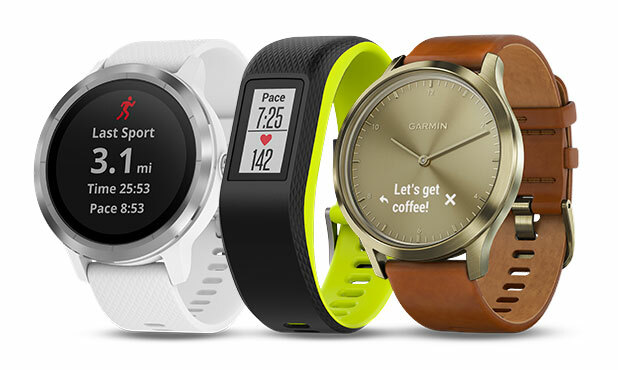 Compared to previous Garmin wearables, the Vivoactive 3 has unique features like contactless payments and preloaded activity profiles. The Vivoactive 3’s lens is made from Corning Gorilla Glass 3, while the Forerunner 35 and the Vivoactive HR feature only chemically strengthened glass. Compared to wearables like the Fitbit Ionic and the Apple Watch, Vivoactive 3’s main strength is in the fact that it’s designed for people who enjoy multiple and specific sports. Sports apps like golfing, running, yoga, and more allow you to track your progress in each activity. The GPS feature of the Vivoactive 3 also helps it determine which exercise you are performing based on your speed and track followed. The Vivoactive 3 is also in a league of its own when it comes to battery life. Not only does it have three times the amount of battery life compared to the Fitbit Ionic, it has a whopping 12 times longer battery life for simple watch usage compared to the Apple Watch. The Garmin Vivoactive 3 is for anyone who seeks technological assistance in multiple areas of life. 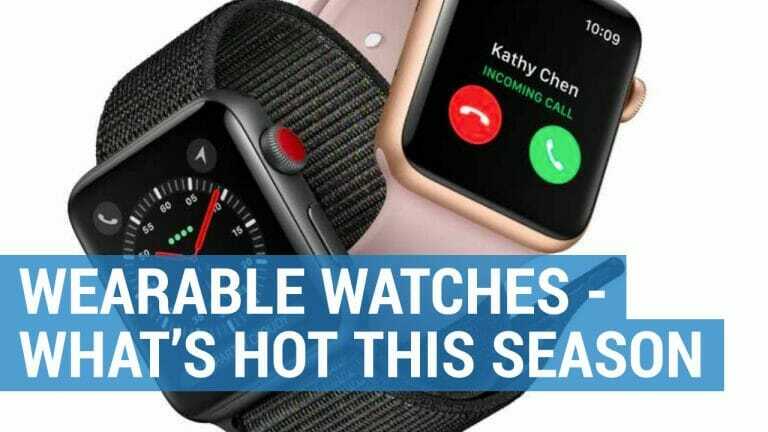 Whether you’re a fitness lover or a tech-savvy professional who’s always on the go, this smartwatch has a robust set of advanced features and benefits to help you manage your life’s agenda. If you tend to forget your wallet a lot or you prefer to not carry one at all, then the contactless payments feature of the Garmin Vivoactive 3 will make you very happy! This feature stood out to me the most when I got this wearable since it’s a rather impressive feature to incorporate into such a small piece of technology. Currently, Vivoactive 3 is Garmin’s only wearable with a contactless payment feature. GarminPay is the technology that allows you to make these contactless payments. It’s a fast and safe alternative to traditional payment methods. Add your credit and debit cards to your Garmin digital wallet, and use them anywhere contactless payments are accepted. Simply enter your passcode, choose your desired card, and hold the watch near the point of payment to complete your purchase. Pay confidently knowing that Garmin assigns unique card numbers to your cards and different transaction codes to your purchases. Your card numbers are never stored on your watch, passed onto merchants, or kept on any servers. 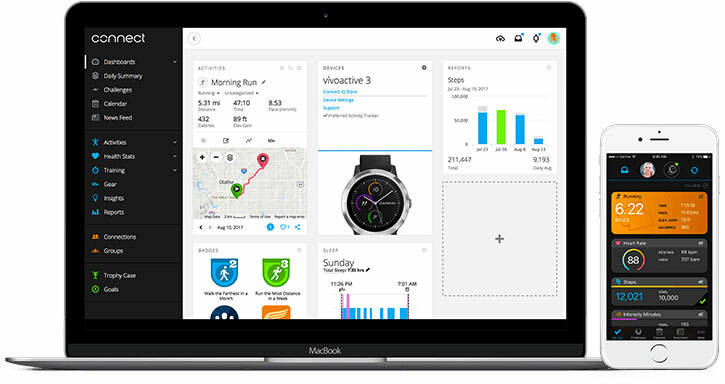 The Vivoactive 3 is customizable through the Connect IQ store, where you can download hundreds of free apps, widgets, and watch faces. Vivoactive 3 is also compatible with the Garmin Connect App and Strava. Keep track of your Uber ride through your watch. Find out the ETA of your ride, your driver’s information, make and model of the car, license plate number, and more. This app uses your exact street address to tell you exactly when rain will start and end. Configure your home’s routines and activate them through your smartwatch. Turn on your home’s lights even when you’re not at home. This app can guide you back to your car by saving your car’s exact location once you park. It’ll store the location for you even if you quit the app. Provides a visual representation of your current heart rate and heart rate zone. Garmin Elevate, the wrist-based heart rate technology found in this watch, helps you monitor your fitness activity as well as your stress levels and heart rate. This watch was designed to give you a VO2 max score to help you analyze your personal health. A VO2 max score is a super useful number that can tell you how fast your body can absorb oxygen, and therefore how fast you can move during your workouts. A high VO2 max score means that you have superior performance capabilities, while a low VO2 max score means you have low to poor fitness capabilities. That being said, your VO2 max score is definitely something you can change. It directly correlates with how healthy you live your life. While individuals who are professional athletes may not have a lot of room to improve their VO2 max score, the rest of us can work every day to be more active and improve our VO2 max scores. Once your VO2 max score is established, your different fitness apps can give you a target training time for your specific level of fitness. Along with giving you a VO2 max score, your watch can monitor your heart rate no matter your physical activity status. It also monitors your heart rate variability (HRV) to determine your stress levels. Your Vivoactive 3 can also keep track of your custom workouts. Create a custom workout online and download it to your watch. Once you begin your workout, your watch will keep track of your reps, rest times, and more for you. Is Vivoactive 3 waterproof?For the most part, yes. 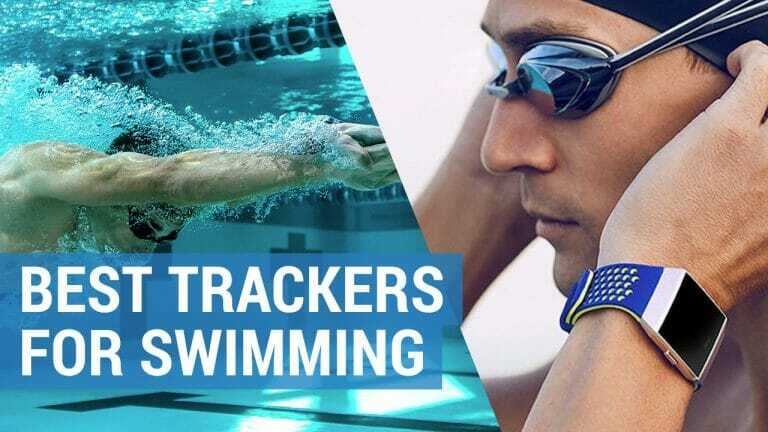 The Vivoactive 3 is certified Swim/5 ATM water resistant. This means that it is suitable for the shower, rain, snow, swimming, diving, snorkeling, and splashes. It is not suitable, however, for scuba diving or intense water sports. How big is the Vivoactive?The Vivoactive measures 4.34 x 4.34 x 1.17 cm. 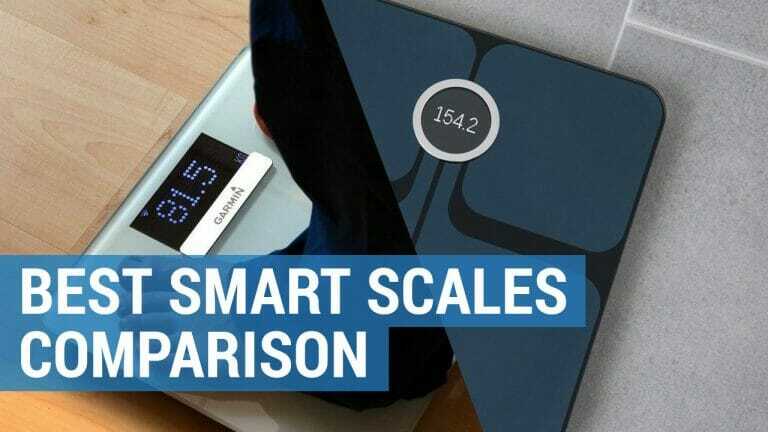 It fits wrists with a circumference of 12.7-20.4 cm. It weighs 1.5 ounces. Does Vivoactive have any buttons?This model only has one physical button, located on the side of the watch’s face. What does Vivoactive come with?The box includes the Vivoactive 3, a USB charging/syncing cable, and user manuals. What clock features does Vivoactive have?The Vivoactive 3 features time & date, GPS time syncing, automatic daylight savings switching, alarm clock, timer, stopwatch, and a customizable watch face. What colors does Vivoactive come in?The Vivoactive 3 comes in Black with Stainless Hardware, Black with Slate Hardware, and White with Stainless Hardware. A variety of bands and straps are also available separately, including moss, azure, dark brown, and light brown quick-release bands. What kind of smart features does Vivoactive have? 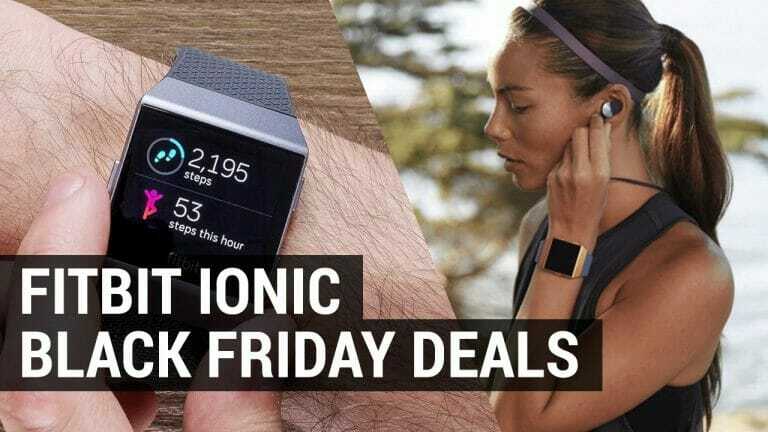 What kind of activity tracker features does Vivoactive have? What are some of the preloaded activity profiles? Running profiles include running, treadmill running, and indoor track running. Cycling profiles include biking and indoor biking. Outdoor profiles include rowing, skiing, snowboarding, stand-up paddle boarding, and XC skiing. Swimming profile includes pool swimming. Golfing profile measures shot distance, yardage to F/M/B, yardage to layups/doglegs, and much more. Garmin has made a wearable that can comfortably compete with other top wearables on the market. We hope you found this Garmin Vivoactive 3 review both informative and insightful. The Garmin Vivoactive 3 is indeed one of the best wearables money can buy.